Crisis Chronicles Press is thrilled to publish Martin Willitts, Jr.'s latest chapbook, City of Tents: Poems About the Occupy Movement and Other Items Taken From the News, in October 2014. According to the author, "This is a collection of poems based on protest and social issue concerns. The poems start with the Occupy Movement, and include forced slavery, forced migrations, disenfranchised people, and other subjects. I question a lot in this book. As a Quaker, I find many things troubling in this world. I scold my own generation who had protested war, for women and minorities. Where are they? They should have joined Occupy, not the Tea Party." 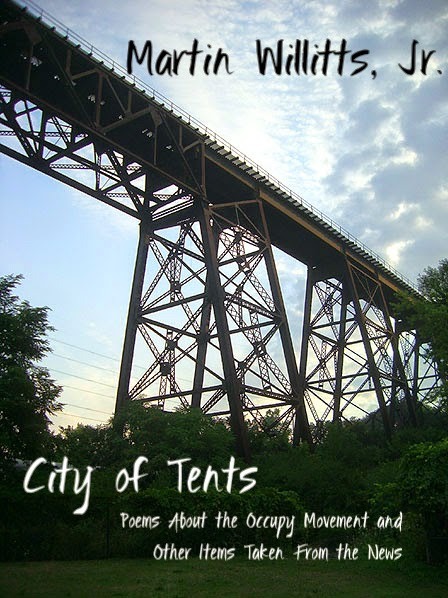 City of Tents is a 38 page, handmade, 8.5 x 5.5", saddle-stapled chapbook featuring 22 poems including "Occupy This," "Hell for Plants," "If Pull Down the Empty Sky, "The Passion of Sacco and Vanzetti" and much more. ISBN 978-1-940996-10-3. Available for only $7 from Crisis Chronicles Press, 3344 W. 105th Street #4, Cleveland, Ohio 44111 USA. "Willitts calls out the irrationality of the put-on soundbite, of cruelty and greed. He asks of us and society to do the uncomfortable work of self-examination. "After we're wrung wet, he offers sparing notes like plates of sunlight: 'joy as temperamental as a geyser' and 'a cautionary song of Amazing Grace.'" "There are two pervading themes braided throughout City of Tents: 'He could have been any of us' and 'Words can…be an unlit match.' Willitts confronts oppression and imprisonment in its many varied guises, including poverty, bullying, ignorance, and war. He also offers hope: 'I open envelopes of promises—heritage seeds…small changes begin.' City of Tents is a demand for political and socio-economic awareness. Heed its call!" "This is a grief book, a human emotions book, a book-length rhetorical question capable of leading the body into an activist martial stance in the street, among a gathering of tents. Willitts gives us a long hard look at 'the type of nothingness nobody understands.' As the 'floating world' sink[s] it is an excess of belief that keeps us afloat. Will we be able to tow its weight? Can we adjust these norms by taking the sinking weight of a world on our shoulders? "What is being modeled for us—what it is that we inherit: 'to take things apart and not necessarily put them back together.' Yet, through these poems, these proposals, the pulse being pumped into a desire for peace and rightness, he (we) are willing to stand up for this! We are actually how the things get put back together." Martin Willitts, Jr. is a retired librarian living in Syracuse, New York. He currently evaluates Prior Learning for SUNY Empire State College. He is a Quaker. He is a visual artist of Victorian and Chinese paper cutouts. He was nominated for 5 Pushcart and 4 Best of the Net awards. He provided his hands-on workshop “How to Make Origami Haiku Jumping Frogs” at the 2012 Massachusetts Poetry Festival. Martin has 5 full-length books and over 20 chapbooks including Art Is Always an Impression of What an Artist Sees (Edgar and Lenore's Publishing House) and Swimming In the Ladle of Stars (Kattywompus Press). He is the winner of the inaugural Wild Earth Poetry Contest for his full length collection Searching for What is Not There (Hiraeth Press). 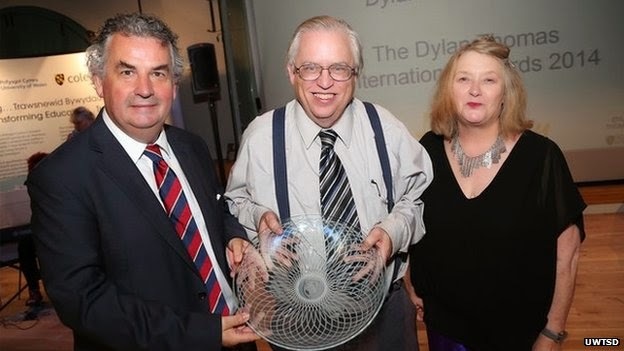 He won the William K. Hathaway Award for Poem of the Year 2012 and he won the Dylan Thomas International Poetry Award in 2014.
loking forward to this one John.